Everybody needs to get clean, but we don’t all do it in the same way. And when it comes to the choice between a hot bath or a quick shower, there are some pretty strong opinions on both sides. But which is better? The real answer is simple: whichever one you prefer. But the two methods do have their own strengths and weaknesses, so depending on your priorities, one might be better for you than another. Let’s compare the two and see how they stack up. While it can feel great to take a long soak in a steaming bath, it might not always feel great afterward. That’s because long, hot baths can actually dry out your skin, leading to itching and flaking. People with sensitive skin conditions like eczema or psoriasis can have worse reactions. Shorter showers with slightly cooler water can help you avoid this problem. On the other hand, baths provide the opportunity to soak in something soothing. Bath bombs, oatmeal blends, epsom salts and other additives can turn an ordinary bath into a rejuvenative experience, and some of these products are designed to relieve specific skin conditions. If you choose to try these, safeguard against dry skin by making the water no hotter than necessary and moisturizing after drying off. Showers are quick and to the point — other than the few seconds you’ll spend waiting for the water to warm up, you’ll spend the entire time getting clean and moving on with your day. A bath is intended to be a more leisurely experience, but even if you have time to take things slow, taking a bath the right way poses some challenges. For instance, shampooing your hair in a bath can be difficult, and rinsing it afterward can be much more so. And when you’re done, it’s important to rinse off your body with clean water before drying so that you aren’t left with an itchy film of soap. If that hassle isn’t enough to chase you out of the bath and into the shower, consider upgrading your bath fixtures to include a handheld wand. It’ll give you the water pressure you need to get fully cleaned and rinsed without standing up and using a traditional showerhead. Unless you’re fond of extra long showers, the shower is the more eco-friendly option. There’s no way around the hefty water consumption of a luxurious bath, but if you want to push your water conservation to the limit, ask your local plumber about upgrading to water-saving fixtures. Who doesn’t like to take a load off every once in a while? With a bath, you can relax your entire body and focus on other soothing things you might use to enhance the experience, like music or aromatherapy. What’s more, a soak in warm water can soothe sore muscles and aid in recovery from physical stress. So if you’re getting clean after a tough workout, consider opting for the bath to give your body a break. 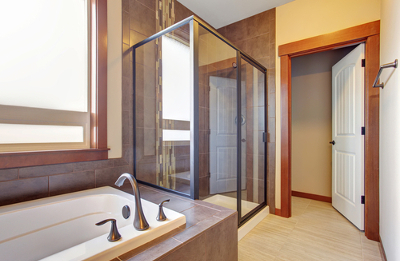 If all this back and forth about baths versus showers has you wishing for a more luxurious bath experience, maybe it’s time for a bathroom remodel. Feel free to call your local Rods Away to learn more about the latest designs in both tubs and showers, and we can help you plan the bathroom of your dreams.